T. W. House Advertisement. Image available on the Internet and included in accordance with Title 17 U.S.C. Section 107. HOUSE, THOMAS WILLIAM (1814–1880). Thomas William House, businessman, was born in the village of Stoke St. Gregory, Somersetshire, England, on March 4, 1814. The family was of Dutch origin, the early form of the name being Huis. In May 1835 House landed in New York, where for a year he earned his living as a baker. His proficiency caused him to be discovered by the proprietor of the St. Charles Hotel. He was induced to move to New Orleans and take charge of the bakery of that famous establishment. 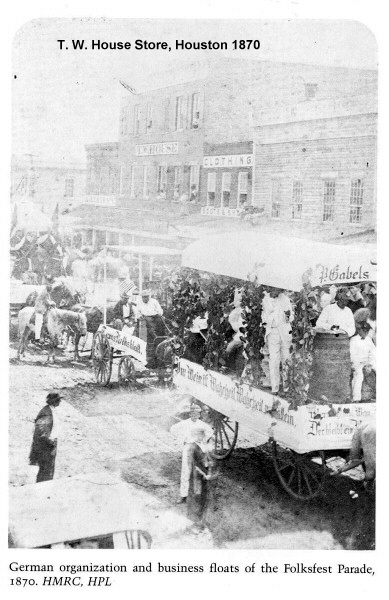 In 1838 the firm of House and Loveridge, bakers and confectioners, opened in Houston, Texas. The next year House formed a partnership with Charles Shearn, who was later chief justice of Harris County. In 1840 House married his partner's daughter, Mary Elizabeth Shearn; and it was in this year that he began accepting bank deposits. Alone in business for a time, he produced and sold the first ice cream in Houston. He restricted his confections to one side of the store and filled the other with dry goods, developing an extensive wholesale trade with the interior. T. W. House Store, 1870. Image available on the Internet and included in accordance with Title 17 U.S.C. Section 107. 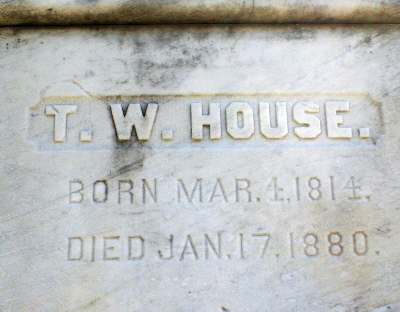 T. W. House was a Director of the Houston & Texas Central Railway Company. Image available on the Internet and included in accordance with Title 17 U.S.C. Section 107. 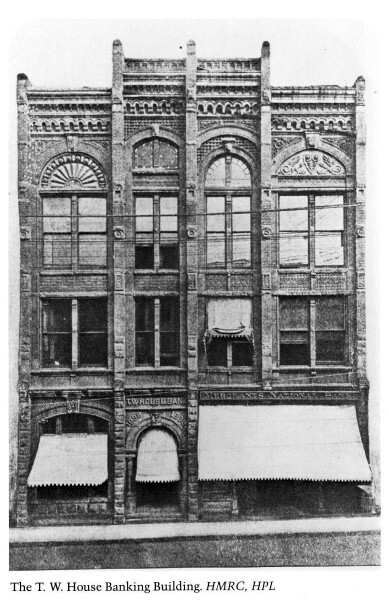 T. W. House Banking Building, 1870. Image available on the Internet and included in accordance with Title 17 U.S.C. Section 107. House's Grave. Image available on the Internet and included in accordance with Title 17 U.S.C. Section 107. After a second association with his father-in-law, in 1853 House bought out the large jobbing business of James H. Stevens and Company, dealers in dry goods and groceries. The $40,000 he paid for it was the largest sum of money to change hands in Houston up to that time. The firm name became "T. W. House and Company," the company being Edward Mather, who had been in House's employ since 1841. The firm was then the largest wholesaler in the state; it accepted cotton in payment for goods and set up cotton factoring as a separate department. In 1862 Mather withdrew, leaving his partner alone again. Ox wagons were accustomed to waiting half a day at the T. W. House Plantation Commissary and Wholesale Grocery for their turn to be loaded. House once remarked that a keg of his nails could be found in every church in Texas. As a commission merchant, wholesale grocer, cotton and wool factor, and hardware and dry goods dealer, he handled commodities including hides, whiskey, syrup, guns, axes, chains, and blacksmith's supplies. His great private bank grew out of cotton factoring. In 1872 House acquired an extensive sugar plantation at Arcola, where he made excellent sugar. He also grew cotton and had a 70,000-acre ranch in La Salle County. In 1851 House helped organize the Houston and Galveston Navigation Company "to navigate steamboats between Houston and Galveston and on other streams tributary to Galveston Bay," carrying passengers, freight, and United States mail. He also worked with the Texas Transportation Company, the Houston Direct Navigation Company, and the Buffalo Bayou Ship Channel Company, all of which contributed to the development of Houston. 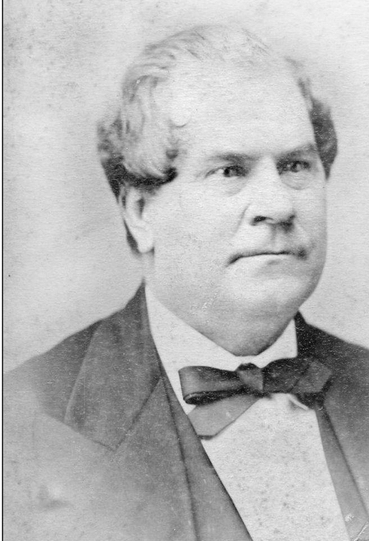 House served a term as mayor of Houston in 1862. In 1866 he organized the city's first public utility, the Houston Gas Company. The plant was erected and the mains laid in the face of general public indifference. Hotels and other public places were the first to install gas, then private homes accepted the innovation, and finally gas street lights appeared. It is difficult to overestimate House's share in the building of Houston. He was active in organizing the first street railway, the Board of Trade and Cotton Exchange, and the Houston and Texas Central and other railroads. Gen. John Bankhead Magruder had a high regard for House's services in the Confederacy. His cotton wagons made their slow way to the Mexican border and returned with loads of vital supplies. From the cupola of his pillared home in Galveston, on stormy nights House would study with a glass the blockading United States fleet. Early the next morning he would survey the hostile vessels again. If any were missing from their stations, they were chasing his blockade runners. House died on January 17, 1880, in San Antonio, where he had gone for medical attention. His will directed that for five years his estate should be held together and his banking and mercantile business should be carried on in his name. His wife had died ten years before. One daughter and four sons survived him, of whom Edward Mandell House, adviser to President Woodrow Wilson, became the most widely known. David G. McComb, Houston: The Bayou City (Austin: University of Texas Press, 1969; rev. ed., Houston: A History, 1981). Vertical Files, Dolph Briscoe Center for American History, University of Texas at Austin. Handbook of Texas Online, Julia Beazley, "HOUSE, THOMAS WILLIAM," accessed April 24, 2019, http://www.tshaonline.org/handbook/online/articles/fho68.